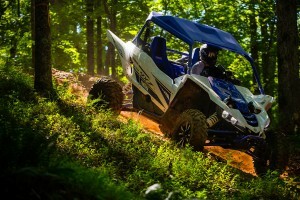 Last year, Yamaha launched the all-new YXZ1000R. A true driver’s machine, it combined the first five-speed manual transmission found in an SxS, with an engine featuring a screaming, top-end focused power band. 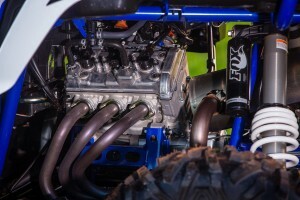 The engine came wrapped in a stout, rigid chassis, with fully adjustable Fox Podium RC2 shocks. 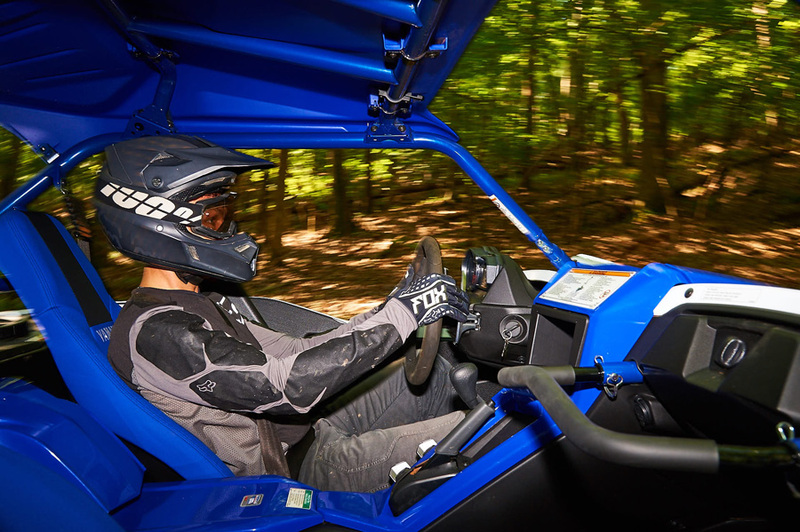 The YXZ1000 delivered a level of control to the driver never before available in a UTV. 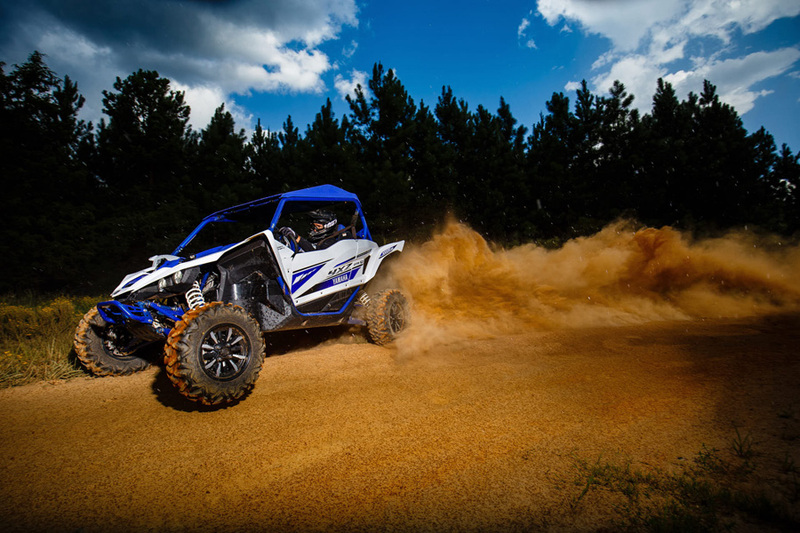 Nearly one year after the world launch of the YXZ1000R, Yamaha invited us and other members of the media to join them in Union, South Carolina on the grounds of the Big Buck GNCC race, to drive the second addition to their YXZ family, the 2017 YXZ1000R SS. SS stands for sport shift, replacing the manual clutch and center-mounted shift lever with a set of steering column-mounted paddle shifters, and a slick computer-controlled auto clutch. Were these few changes enough to make this top-end focused, West Coast screamer into a capable East Coast trail machine? We were about to find out. The 112HP, 998cc, fuel-injected, three-cylinder, four-stroke engine found in the SS features four-valves and double overhead cams per cylinder. It’s, for the most part, identical to the one found in the original 1000R, right down to its five-speed gearbox. The 112HP, 998cc, fuel-injected, three-cylinder, four-stroke engine found in the SS features four-valves and double overhead cams per cylinder. It’s, for the most part, identical to the one found in the original 1000R, right down to its five-speed gearbox. The big difference between the 1000R and 1000R SS is that the manual clutch and pedal have been replaced by a computer-controlled auto clutch system. The center console-mounted shift lever now serves the purpose of simply selecting between forward, neutral, and reverse. Shifting up and down through the gears is handled by the right and left paddles mounted to the steering column. The big difference between the 1000R and 1000R SS is that the manual clutch and pedal have been replaced by a computer-controlled auto clutch system and steering column mounted paddle shifters. In addition to an added coolant temperature gauge on the instrument display on both models, the SS also receives a half-clutch indicator light, showing when the computer-controlled clutch is in engaged for takeoffs or gear changes. There’s also a Launch Control indicator light, showing when the launch control system has been engaged; more on that later. The intake draws air from inside the cockpit between the occupants. A dual-filter setup with both a foam and wet paper filter means better filtration for longer engine life in dusty conditions. Driving on the harder, less power sapping trails of the East Coast, the engine’s low-end and midrange feel far more effective for casual driving. You can crawl along most trails and growl your way up some pretty steep inclines never touching the top-third of the RPM range. Turn the key to bring the engine to life, bump the center-mounted lever forward into drive, and the transmission shifts from neutral into first or shifts back into reverse. A light touch of the pedal allows you to pull away smoothly, or stomp the gas to take off with authority; either way, there’s no clutch pedal to worry about. Power delivery on the SS is identical to that of the standard model, pulling hardest from 7000RPMs to redline at 10,500RPMs. The R’s engine felt pretty stall proof driving in deep sand in our first couple tests, but required you to keep it in the top third of the power band if you wanted to accelerate with any authority on a steep dune. Driving on the harder, less power sapping trails of the East Coast, the engine’s low-end and midrange feel far more effective for casual driving. You can crawl along most trails and growl your way up some pretty steep inclines never touching the top-third of the RPM range. In the trees, the smooth, linear low-end and midrange power and wide-ratio gearbox make this missile manageable for less skilled drivers. With its power focused in the top-end, if you want to race your buddies, you’ll need to keep the RPMs up, requiring you to work the gearbox. Fortunately, the new Sport Shift system makes this a simple, almost foolproof process. With its power focused in the top-end, if you want to race your buddies, you’ll need to keep the RPMs up, requiring you to work the gearbox. Fortunately, the new Sport Shift system makes this a simple, almost foolproof process, without taking back much of the added control a manual shift transmission provides. Accelerating through the gears, you can back off the gas; simply keep the pedal down and upshift. The computerized shifting cuts the power, activates the clutch, makes the shift, and returns you to full throttle almost instantaneously allowing for full power drag races without ever taking your foot out of it. One big advantage of a manual shift transmission over CVTs and auto clutch systems is the ability to dump the clutch for drag races. Although Yamaha eliminated the clutch pedal, they managed to retain that ability with their ingenious Launch System. Sitting at a dead stop in first gear, apply the brake pedal and pull in both shift paddles at the same time. 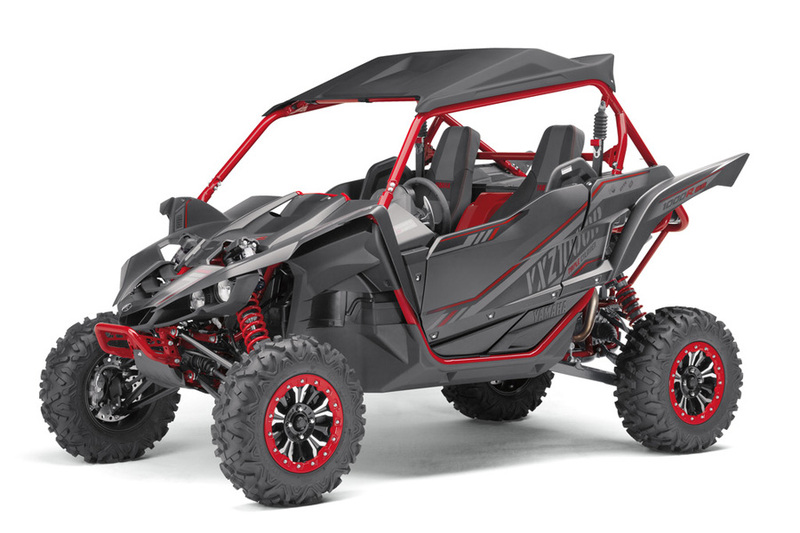 When the Launch System indicator light comes on, you can rev the engine up anywhere from 5000RPMs to redline, release both paddles, and the YXZ SS dumps the clutch launching you off the line. One big advantage of a manual shift transmission over CVTs and auto clutch systems is the ability to dump the clutch for drag races. Although Yamaha eliminated the clutch pedal, they managed to retain that ability with their ingenious Launch System. Being able to shift without removing a hand from the steering wheel aids your ability to control the car when driving at a race pace in extremely tight woods where mistakes are measured in fractions of an inch. Coming down from speed, you can easily downshift under braking keeping your gear selection perfectly matched for maximum acceleration out of corners, or leave it a gear high and torque out of turns. If the engine nears idle and the wheels almost reach a complete stop, the Sport Shift system will automatically return the transmission to first gear. If you’re hard on the gas driving in a higher gear and the engine starts bogging down, the transmission automatically downshifts instead of simply slipping the clutch. This keeps the engine from stalling while protecting the clutch from excessive wear. The transmission’s ability to downshift when absolutely necessary makes this car easily drivable for novices, without detracting from the high-performance experience for highly skilled drivers. Being able to shift without removing a hand from the steering wheel aids your ability to control the car when driving at a race pace in extremely tight woods where mistakes are measured in fractions of an inch. Dynamic Clutch engages, allows the engine to rev up to 6000RPMs, and quickly feeds in the power with the clutch, providing the thrust to take off on hills or crawl over rocks. Another brilliant feature of the Sport Shift system is its Dynamic Clutch Control, useful for times when you’re stuck in a rock garden or want to take off on the face of a hill. In first gear, if you are hard on the gas but the wheels aren’t moving, the Dynamic Clutch engages, allows the engine to rev up to 6000RPMs, and quickly feeds in the power with the clutch, providing the thrust and momentum needed to clear the obstacle. While it may not get you out every time, it does seem to work pretty well. Maybe the most skilled drivers would benefit from a manual clutch in this situation, but we believe that most drivers and their clutches will be better off with Yamaha’s Dynamic Clutch engagement handling it. About the only thing you sacrifice is the ability to slip the clutch in a situation where you don’t want to downshift, but shifting is so fast and precise, we honestly never missed it. Plus, you hardly have to worry about yourself or your co-driver cooking an expensive clutch. Sport Shift opens up high-performance style driving to a much larger audience and puts more control in the hands of the driver. The drive train can be switched between two-wheel-drive, four-wheel-drive, and four-wheel-drive with differential lock. 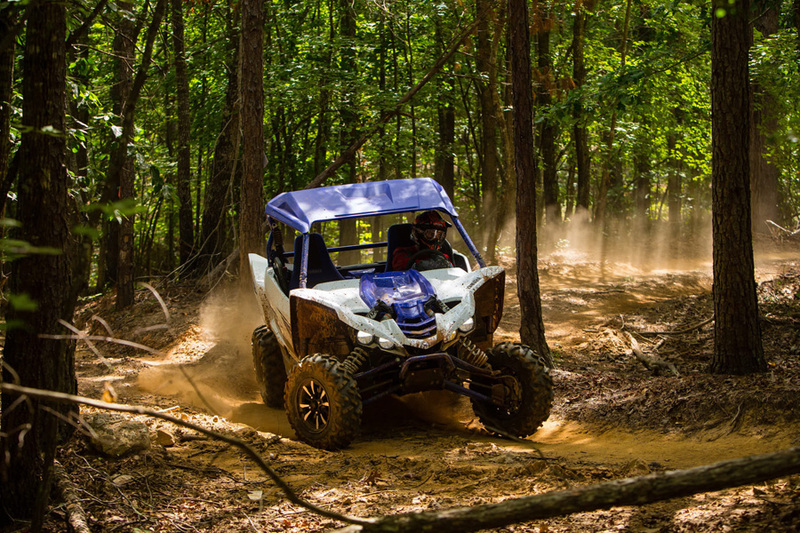 We spent a majority of our time on four-wheel drive to maximize steering precision on the tight trails. Sport Shift opens up high-performance style driving to a much larger audience and puts more control in the hands of the driver. 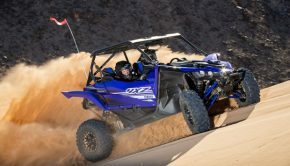 The YXZ1000R is built on a stout looking steel chassis with double wishbone suspension at both ends. The design of the rear control arms somewhat mimic the design and function of trailing arms and radius rods, but with a more rigid and robust design. 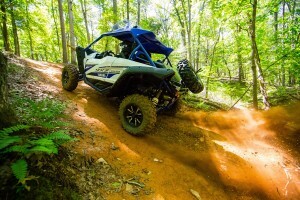 The YXZ measures in at 6-inches wide with a 90.5-inch wheelbase and 12.9 inches of ground clearance. Aftermarket chassis component builders whom we’ve spoken to, feel that the YXZ is a pretty overbuilt machine. 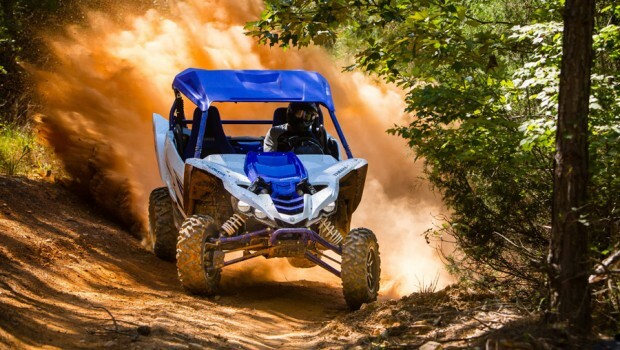 This is the type of durability we hoped Yamaha would bring to the sport side-by-side segment. 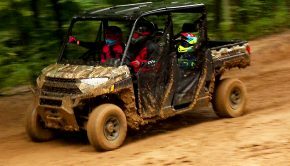 The YXZ measures in at 6-inches wide with a 90.5-inch wheelbase and 12.9 inches of ground clearance. 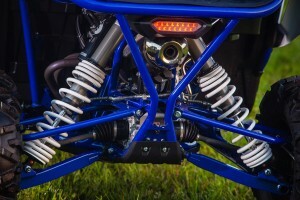 Fox Podium 2.5, RC2 shocks are used on both the Blaze Orange and Yamaha Blue/White Models. They feature preload, high and low-speed compression, and rebound damping adjustments. 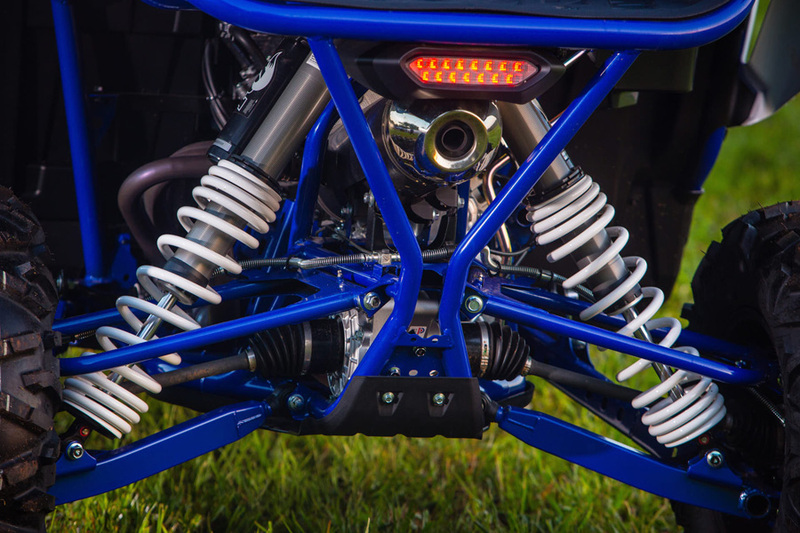 Fox Podium 2.5, RC2 shocks are used on both the Blaze Orange and Yamaha Blue/White Models. They feature preload, high and low-speed compression, and rebound damping adjustments. The rear shocks featuring Fox’ anti-bottoming technology help reduce any harsh bottoming sensations. They control 16.2 inches of wheel travel up front and 17 inches out back. The YXZ seems rather maneuverable in the woods for its 64-inch width. Steering is accurate with the car going right where it’s pointed. 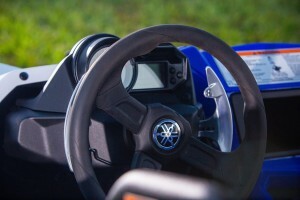 Yamaha’s speed sensitive electronic power steering feels light but natural. It keeps you feeling connected to the trail, while filtering impacts from the steering that could easily knock you off line and into a tree. 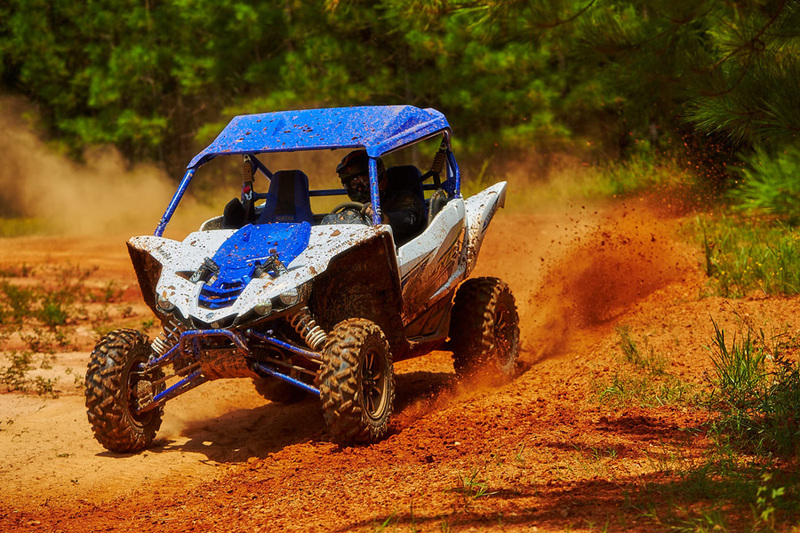 In rough, rutted turns and charging through bump-filled, high-speed sections, the chassis’ rigidity adds to the car’s precise handling and high-performance feel. 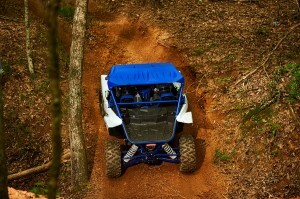 The YXZ seems rather maneuverable in the woods for its 64-inch width. Steering is accurate with the car going right where it’s pointed. 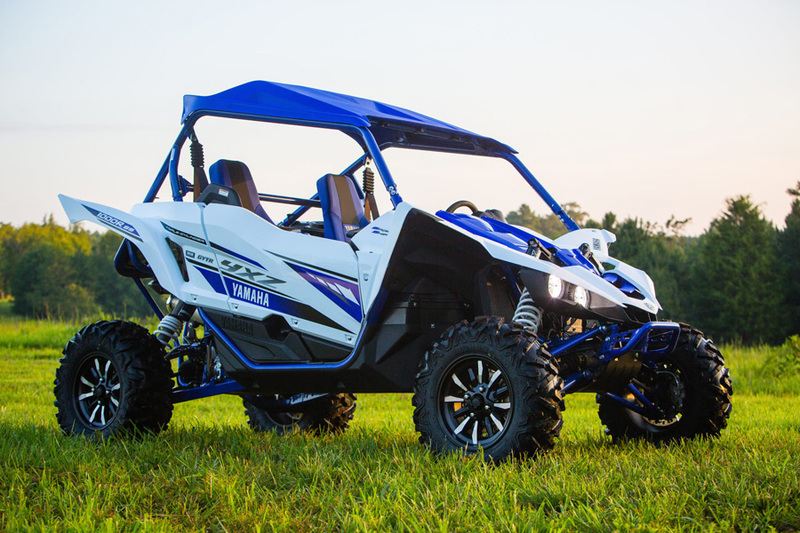 Yamaha’s speed sensitive electronic power steering feels light but natural. Body roll isn’t a problem. Driving hard, the car feels stable and planted, even on rough off-camber turns. At no point does it feel like it’s going to surprise you and two-wheel without ample warning. The Fox shocks’ high level of adjustability lets them conform well to the smaller high-speed impacts of roots and more square-edged bumps of the clay-based East Coast trails. Out of the box, they did a decent job of filtering out abrupt high-speed hits and can be made notably more forgiving with a little adjustment as we discovered. Rebound damping is a bit fast stock, making the rear end lose contact with the ground from time to time on kicker bumps. Dialing in more rebound damping helps. Bottoming resistance from big hits and G-outs isn’t an issue for the YXZ in the woods. The shocks can be set up well for running a race pace or casual exploring. Maybe it’s not quite RZR XP plush, but it benefits from less body roll. The Fox shocks’ high level of adjustability lets them conform well to the smaller high-speed impacts of roots and more square-edged bumps of the clay-based East Coast trails. Bottoming resistance is plentiful. Like most other aspects of the car, the brakes lend themselves to precise, high-performance driving. Four-wheel hydraulic disc brakes with dual piston calipers reside at all four corners. Stopping power is abundant. A good, progressive feel through the pedal lets you choose between keeping the car hooked up on downhills and locking the rear tires for brake slides into turns. Like most other aspects of the car, the brakes lend themselves to precise, high-performance driving. 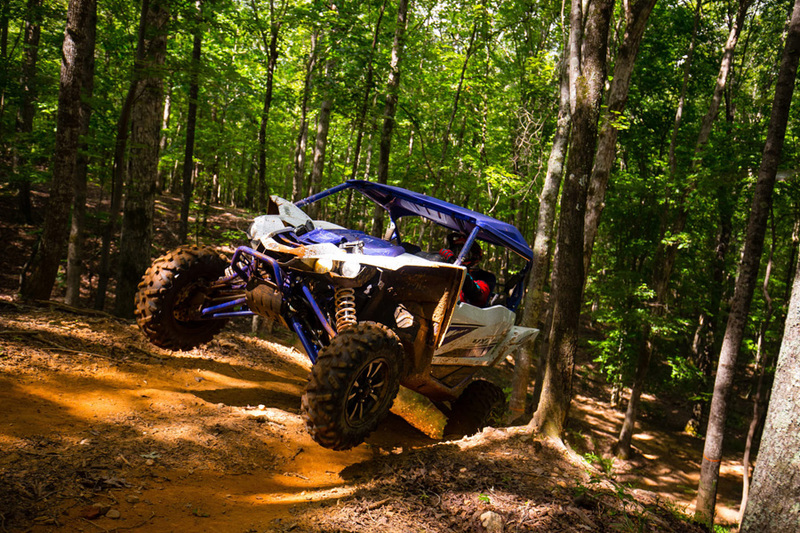 Maxxis’ 27-inch, Bighorn 2.0 tires custom built for the YXZ100R provided excellent traction and control in everything the Big Buck course had to offer, performing well as an all-condition tire. 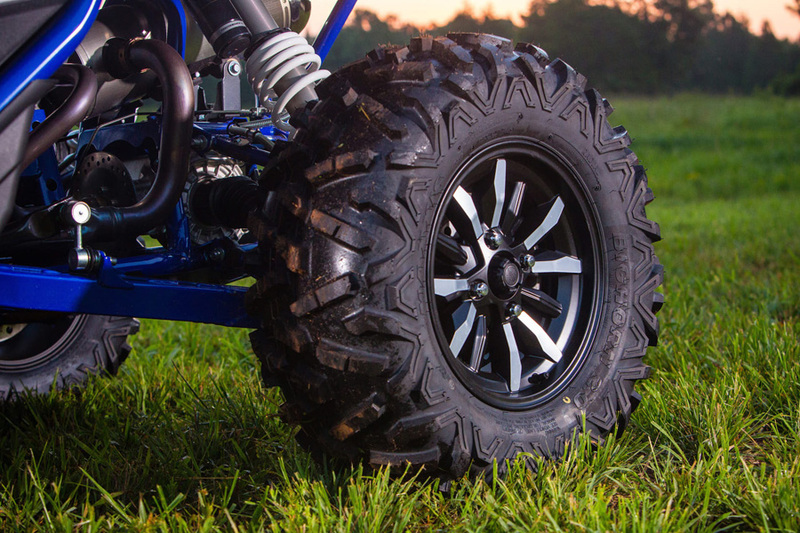 The Bighorns come mounted on 24-inch alloy wheels. The red clay-based trail conditions started off moist with quite a few water puddles in the morning and dried throughout the day leaving only an occasional mud hole and somewhat dusty conditions. Maxxis’ 27-inch, Bighorn 2.0 tires custom built for the YXZ100R provided excellent traction and control in everything the Big Buck course had to offer, performing well as an all-condition tire. The Bighorns come mounted on 24-inch alloy wheels, which held up well to the beating we dished out. Tilt steering and a driver’s seat that can be adjusted without tools lets most drivers put the controls easily within reach. The laid back, high-back seats deliver a good amount of comfort for OE seats. Some drivers complained that it was difficult to keep yourself back in the seat on the original YXZ with the clutch pedal preventing you from keeping a foot solidly planted on the floorboard. With the clutch eliminated, the SS model enjoys an ergonomic advantage over the standard model. High-quality full doors and a sunroof come standard. Tilt steering and a driver’s seat that can be adjusted without tools lets most drivers put the controls easily within reach. The laid back, high-back seats deliver a good amount of comfort for OE seats. 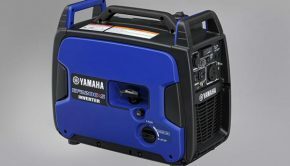 Along with the Blaze Orange and Yamaha Blue/White models, Yamaha also offers a pretty special matt black with red accents Special Edition model. Its biggest upgrade are the industry exclusive, dual-chamber, Fox 2.5, Podium X2 shocks featuring high and low-speed compression and high and low-speed rebound damping. It also comes with color matched, true beadlock wheels seeming like a good value for the added $1,600 price increase over the Blue/White model we tested. Yamaha also offers a pretty special matt black with red accents Special Edition model. Its biggest upgrade are the industry exclusive, dual-chamber, Fox 2.5, Podium X2 shocks featuring high and low-speed compression and high and low-speed rebound damping. The YXZ is a tough customer. Our wave of editors completed the day with no bends, serious dents, or DN’Fs. 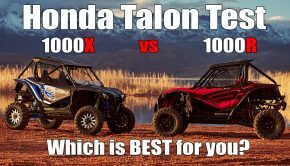 A lack of robust build quality has been one of the largest complaints with high-performance UTVs. With Yamaha’s entrance into the high-performance segment, times are changing. Sport Shift is one of the best innovations we’ve seen in side-by-sides in years with performance you have to experience to believe! Paddle shifters have been used in Formula 1 for years. Now, Yamaha has brought F1-like performance to the world of SS. While there will still be drivers who still prefer a manual clutch, we strongly believe that most drivers from beginner to expert will prefer the Sport Shift system. This engine is still a screamer in the dunes, and Sport Shift will make rapid up and downshifts easier and less fatiguing on long drives. It aids in control and concentration on tight switchback trails. 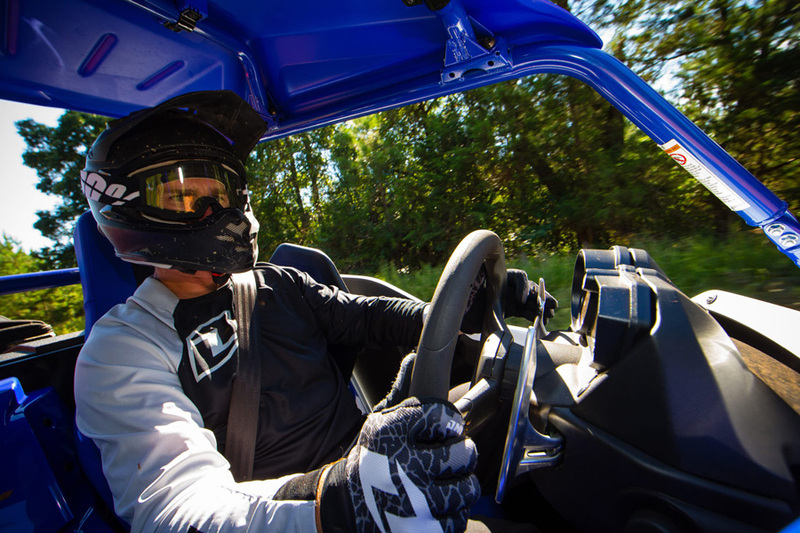 The original YXZ1000R was a great niche machine for high-performance drivers. 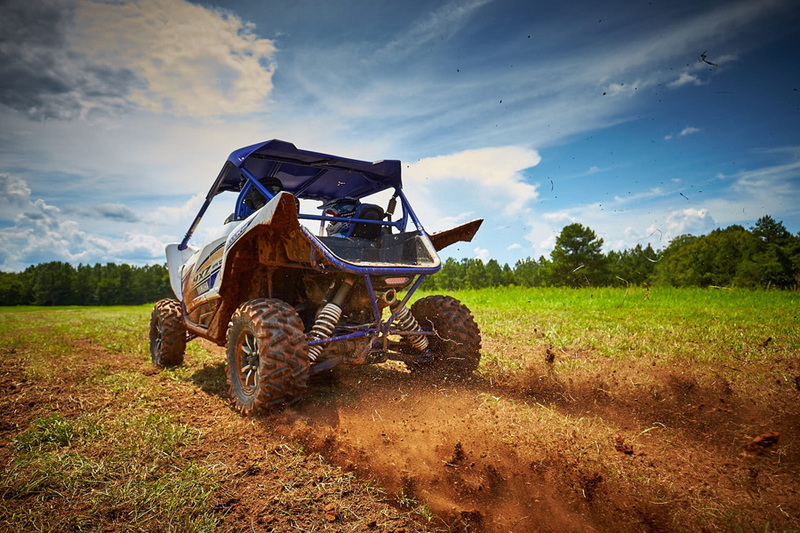 With Sport Shift, Yamaha now has a UTV that nearly anyone can jump into and drive with a higher level of control than the competition provides. Sport Shift is one of the best innovations we’ve seen in side-by-sides in years with performance you have to experience to believe! Summary: Paddle shifters have been used in Formula 1 for years. Now, Yamaha has brought F1-like performance to the world of SS. While there will still be drivers who still prefer a manual clutch, we strongly believe that most drivers from beginner to expert will prefer the Sport Shift system. It aids in control and concentration on tight switchback trails. 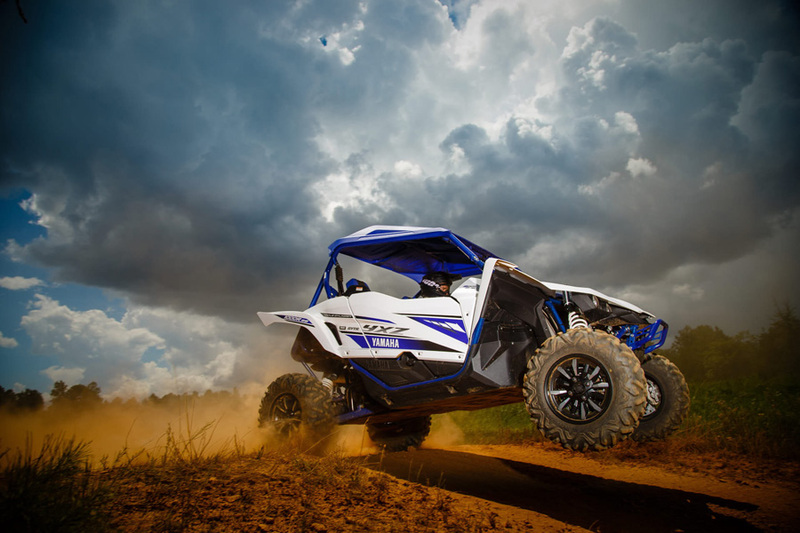 The original YXZ1000R was a great niche machine for high-performance drivers. With Sport Shift, Yamaha now has a UTV that nearly anyone can jump into and drive with a higher level of control than the competition provides. Sport Shift is one of the best innovations we’ve seen in side-by-sides in years with performance you have to experience to believe!